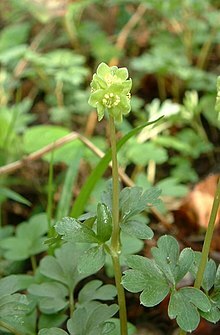 Adoxa moschatellina (five-faces) is the sole member o the genus Adoxa. It grows throughoot Europe, Asie, an North Americae, in hedgerows, cuil forests, at law altitudes in the far north, tae heich altitudes in muntains in the sooth o its range. The plant an its flouers hae a musk-lik scent, which it emits taewards evening when the dew falls. If the plant is bruised this scent disappears. In Europe, it flouers in Aprile an Mey. The names "five-faced bishop" an "tounhaw clock" allude tae the structur o its inflorescence. This consists o five flouers: ane fower-petalled flouer facin upwards, an fower five-petalled flouers facin horizontally, as seen in the picturs. Moschatel, frae "A Modern Herbal"
This page wis last eeditit on 10 September 2013, at 15:00.